Owners of Diamond Resorts timeshares often find themselves trapped in infinite contracts with rapidly increasing maintenance fees which ultimately stems from a mis-sold timeshare contract. Over recent years there have been a number of ground-breaking rulings regarding mis-sold timeshares by many timeshare groups and resorts which have resulted in refunds and compensation. Many owners of Sedona Pines Resort timeshare contracts are entitled to, or have already made claims. There has been a huge increase in timeshare release enquiries and complaints from customers with Sedona Pines Resort timeshares. If you believe you had a Sedona Pines Resort timeshare contract mis-sold to you or you wish to be released from your timeshare scheme, please contact one of our experts at Mercantile Claims or fill in the form below. We can help you cancel your Diamond Resort Sedona Pines Resort Timeshare Agreement Legally. Contact us Now to see if you qualify! Our team here at Mercantile Claims are always on hand to help you with any issues, concerns or questions you have regarding your timeshare contract. Below are some comments and reviews from owners and guests at Sedona Pines Resort. If you have a more specific question please contact our team of experts and we will respond with an answer as soon as possible. First, let’s start with the positive. The staff at Sedona Pines are great!! Very accommodating and helpful. We have been coming to Sedona for a respite from winter for about 5 years now. Let me say that while the red rocks are still there as is the weather so are a proliferation of fees imposed by the resorts and the town. There were always Red rock pass fees, now there are resort activity or utility fees parking fees to park on airport road etc. We bought a getaway from RCI to stay a week at Sedona Pines Resort. When you check in they mandate the payment of an activity fee of $70.00 ($10.00/night). This pays for your use of their washers dryers and all the activities they allow you to attend on premises for free. My problem with it is that our home resorts do not charge people who either exchange into the resort or buy a getaway into it such a fee. IT is covered by the maintenance charges we and other owners pay. On Monday, the resort invited us to a welcome breakfast and we went. The food consisted of greasy or scrambled eggs with too much butter greasy bacon and soggy waffles. Furthermore, we had to listen to about 7 different tour operators try to sell us tours. I did not come expecting to be solicited. The units at Sedona Pines are small even the resort mgr admits this. There were maybe 18 inches between the end of the bed and the closet. My wife and I could barely slide past each other in the kitchen. The units have air conditioning and a ceiling fan but there is no wall switch to turn the fan on. you must stand on the bed and pull a string on the fan to turn it on a dangerous move. The toilet was an adventure too. We called maintenance 3 times on it but it remained temperamental sometimes it flushed other times it would not. Finally, my wife loves to swim and we had some unusual weather for February ie. 79 degrees. When we asked they would not allow her to use the pool as it is the only time they can do maintenance on the pool deck. If you are like us and love to hike around the red rocks you will not get much for the activity fee. Gold Crown resort?? Not in my opinion. Small cottages with bedroom and bath about the size one gets on a cruise. Sunrise comes through the upper semi circle window which does not have any window shade. Only one small family pool and has NO pool service for drinks or food. NO AT & T cell service! They charge $10/day resort fee. A ripoff! Rude. Waste of time. Waste of money. Prepare to be insulted and humiliated. I wouldn’t give them the satisfaction. What a boiler room operation! Unable to answer simple questions. Speak to you like you are stupid. Never again. I have to say that the reviews I read on Trip Advisor about Sedona Pines were very misleading. In addition, the photos that are posted on the Sedona Pines website made the rooms look MUCH bigger than they are. 1. Your “cottage” is essentially a glorified trailer. If you get “2 bedrooms,” you get two trailers connected by a deck, but the 2nd bedroom is little more than that… a bed, small table and chairs and bathroom. 2. In other timeshares that we have stayed, the laundry is right within your private room. At Sedona Pines we had to drive to the laundry building…then wait while our wash was being done…it felt like being back in college. 3. If you can imagine the most complicated coffee pots ever, they have them. If you don’t have the lids on just right when brewing, the coffee starts flowing everywhere…we made a MESS our first time and then had to be very careful the rest of the week. 4. Housekeeping never came on our 4th day, so we had to go ask for towels. 6. Positives…the drive to Sedona is only a few minutes and it is a pretty ride. My mother and sister planned a family vacation day to spend a day in Beautiful Sedona, but our day was hijacked. 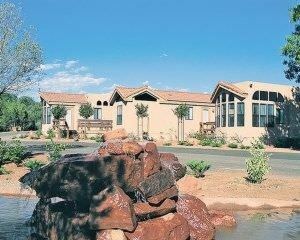 The Sedona Activity Center – Sedona Pines Resort masquerades as tourist travel centre but it is not. It lures the unsuspecting into their facility with signs of jeep rides, helicopter rides, red rock passes, lodging, clean restrooms, free maps, travel tours. Unfortunately for the public, when smartphone GPS map users type in the “Sedona Chamber of Commerce” it leads then to the doorstep of this tourist trap. My mother wanted to treat us to a jeep and or helicopter ride so the Sedona Activity Center looked perfect. Inside in activity center work some very friendly people who hook the public. Once they learned what we wanted they told us about a 17-minute helicopter tour that cost ten dollars. The only catch was that we needed to visit the Sedona Pines Resort for them to show us their property. The activity center confirmed the two appointments that wrecked our day. From the time we bought our tickets to the time we were kicked off their property was well over 90 minutes. It turns out that we didn’t fit their profile, as none of us had our spouses with us. The manager Bob took over our interrogation after Gilbert (a very nice gentleman from Quebec) discovered their sales model wouldn’t work for them. Bob told us we didn’t qualify for the tickets we bought and sent us back down to the receptionist. The receptionist issued us the tickets anyway, but Bob grabbed them from my hand as I was walking out the door. Perhaps if it was just this mistreatment some people could just let it go and enjoy the day. The thing that spoiled the rest of the day is when the helicopter company called to say that we may be financially responsible for the helicopter appointment that the Sedona Activity Center made for us. Once we didn’t get our coupons we never thought to cancel the flights. Bob treated three very financially prosperous individuals like the dregs of earth. I’d be surprised if this is the type of individual that Sedona Pines Reports want representing them. Bob’s gruff and frustrated behaviour (never a handshake, eye-to-eye contact, or pleasant word) was so harsh that I now feel that I need to go out of my way warn as many people as I can to stay away. The City of Sedona should also take steps to mitigate how Sedona Pines Resorts sales team is harming fun loving people you just want to take in the Grandeur. Is it possible that this is how all timeshare sales offices work? We never heard the word timeshare until the presentation started. Bob blamed the Sedona Activity Center for sending us. Gilbert said they are low-pressure sales group, perhaps this is because they quickly hit the ejection seat on families like mine. Mistakes are made every day, all day, all around the world – it just takes a little effort to end them civilly.